Gaining international recognition at any level is a huge honour for any footballer. Bonnyrigg Rose defender Ewan Moyes gained a surprise call-up to the Scotland Juniors ranks this week when Hurlford United’s Ritchie McKillen pulled out through injury. With team-mates Jonathan Brown and Dean Hoskins already having been called up to the squad, Moyes has boosted the Bonnyrigg contingent in manager Keith Burgess’s ranks ahead of their forthcoming participation in next month’s Umbro Quadrangular International Tournament in Glasgow, against representatives from Northern Ireland, the Republic of Ireland and the Isle of Man. 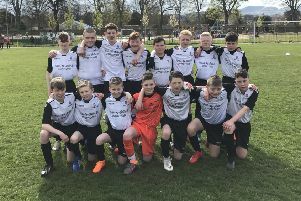 Moyes featured as a second-half substitute on Wednesday night as Scotland Juniors warmed up for the tournament with a 5-1 defeat of a strong Linlithgow Rose side at Prestonfield. The stand-in skipper, who has donned the captain’s armband in each Rose match this season with regular captain Jonny Stewart injured, hopes to round off a fine week by booking Bonnyrigg’s place in the Scottish Junior Cup second round when they host Shettleston tomorrow. It is a competition Rose are desperate to win having reached the semi-final last season. “I got called in at the last minute and I was delighted to get the call-up, it’s a good opportunity and an honour to play for your country,” said Moyes. “It was a really good performance from us on Wednesday considering the squad hasn’t played together. “I was trying to get the info from all the Glasgow boys on what Shettleston are like. They said we should turn them over but it won’t be an easy game. I know they are in the league below, but every time you play a team through the west it’s a battle and it’s competitive, so we aren’t expecting to just walk it. We do expect to take care of anyone in this competition, especially at home. We’ve got to approach it in the correct manner and hopefully get through to the next round. Rose won for the first time under new boss David White last weekend, a 4-1 success over Jeanfield Swifts which kept them in touch with Super League leaders Penicuik Athletic. White was approaching the twilight of his career when Moyes was a 19-year-old at Brechin City having just been released by Hibs. White took his fellow centre-back under his wing at Glebe Park and Moyes is delighted to see him in charge at Rose alongside ex-Brechin midfielder Neil Janczyk. Moyes continued: “Whitey was there last year so he knows a lot of the boys already and how we play, so it has worked out well. I played with Whitey and Janny at Brechin so I know them both well, it’s good them coming in as I got on well with them there. Former Hearts youngster Janczyk was chosen by White to be his assistant just days after taking the job on a permanent basis. The midfielder had planned to continue playing for a few more years after joining Tranent from Penicuik Athletic in the summer, but the 34-year-old couldn’t refuse the opportunity offered to him. “I signed with Tranent at the start of the season and the idea was to play for two years then look into getting a coaching role somewhere,” said Janczyk. “When this came up, it was ideal as I live in Bonnyrigg, I’m actually just around the corner from Whitey, and it was too good to turn down. Elsewhere in the Junior Cup, Premier League leaders Musselburgh Athletic host Newburgh Thistle at Olivebank, while Penicuik take on South Division outfit Livingston United at Penicuik Park. Arniston Rangers entertain fellow Premier League side St Andrews at Newbyres Park and Bo’ness United travel to Dundee to take on Lochee Harp.